Pancreatic cancer. EBSCO DynaMed Plus website. Available at: http://www.dynamed.com/topics/dmp~AN~T114527/Pancreatic-cancer . Updated August 25, 2017. Accessed October 9, 2017. 9/23/2008 DynaMed Plus Systematic Literature Surveillance http://www.dynamed.com/topics/dmp~AN~T114527/Pancreatic-cancer : Boffetta P, Hecht S, Gray N, Gupta P, Straif K. Smokeless tobacco and cancer. Lancet Oncol. 2008;9(7):667-675. 7/21/2009 DynaMed Plus Systematic Literature Surveillance http://www.dynamed.com/topics/dmp~AN~T114527/Pancreatic-cancer : Li D, Morris JS, Liu J, et al. 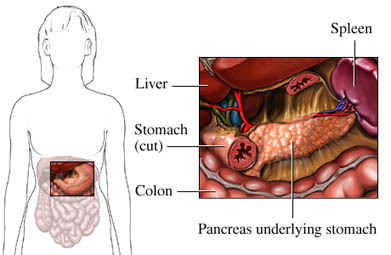 Body mass index and risk, age of onset, and survival in patients with pancreatic cancer. JAMA. 2009;301(24):2553-2562. 3/5/2010 DynaMed Plus Systematic Literature Surveillance http://www.dynamed.com/topics/dmp~AN~T114527/Pancreatic-cancer : Tramacere I, Scotti L, Jenab M, et al. Alcohol drinking and pancreatic cancer risk: a meta-analysis of the dose-risk relation. Int J Cancer. 2010;126(6):1474-1486.